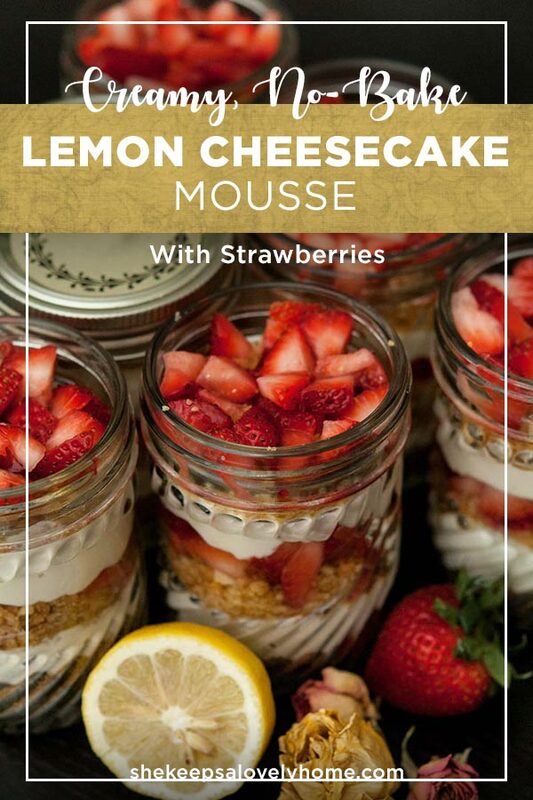 This no bake lemon cheesecake mousse will become your favorite summer picnic treat! It’s sweet and tart, smooth and creamy – with a Nilla Wafer cookie crumble. 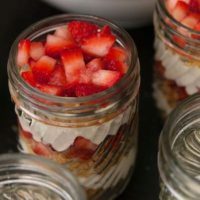 I make a pumpkin cheesecake in the fall, a key lime cheesecake in the spring, and a white chocolate cheesecake in the winter (and a few other kinds of cheesecakes throughout the year too), but I love this one for summer picnics! When it comes to picnics, you know some friends arrive right away, but others roll up on their bikes later in the day, so a dessert like this is perfect to offer once everyone is finally happily sat on the picnic blanket. 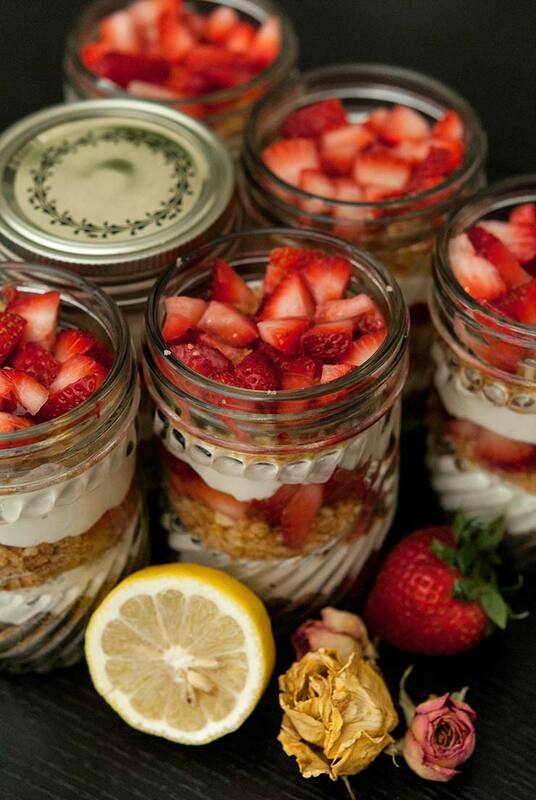 You can make this lemon cheesecake mousse in cups or in these little mason jars! No baking, no fuss! It’s just as good 5 hours later when kept in a cooler, as when you walked out the door. Chop your strawberries into tiny pieces first, and set them aside. 1. Grind Nilla Wafers in a food processor, or put them in a bag and smash them with a spoon until they’re finely crumbled. 2. Melt 4 tablespoons of butter and mix into crumbles throughly. 3. Whip the heavy whipping cream until fully whipped in a blender. Pour into a large mixing bowl, then mix in cream cheese – preferably already whipped, but if you don’t have it, it’s fine. It’ll just take little more effort to mix. Pour in 1 tbsp. 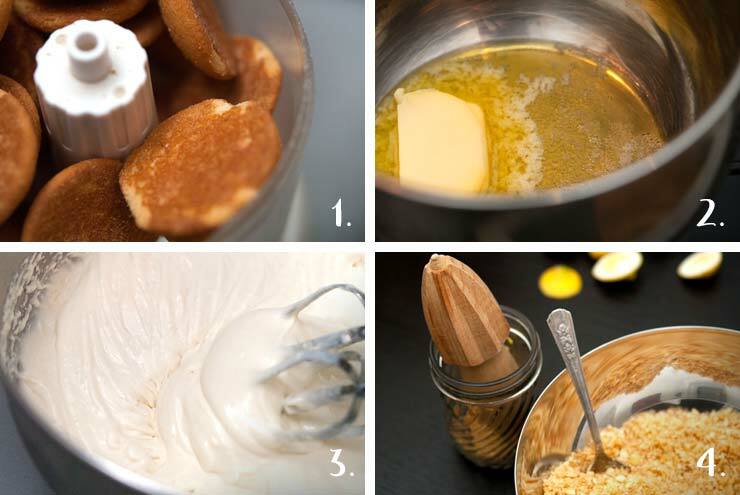 of vanilla extract, the condensed milk (only use ⅔ if you’d like it less sweet) and ½ cup lemon juice. 4. Spoon about 2-3 tsp. 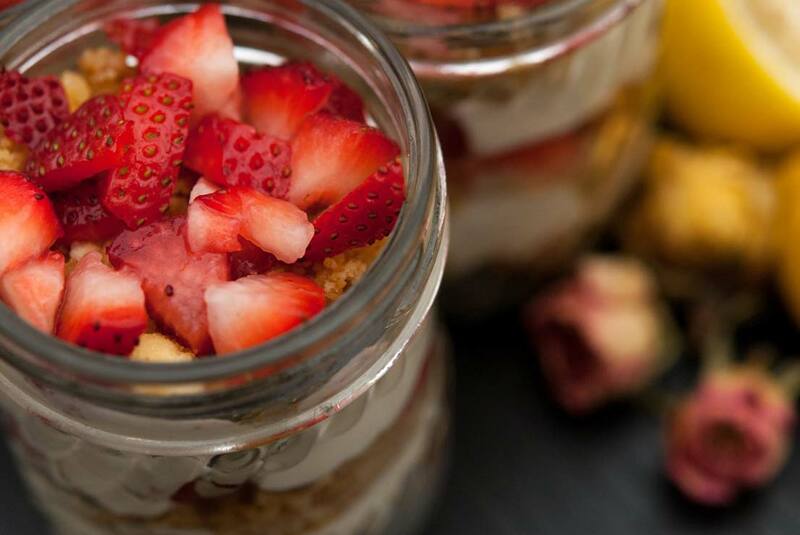 of the crumbles into your jars or cups – enough to make your first layer, and gently pat down. Fill a pastry bag (or just spoon) your mouse on top of the first crumble layer. Add another crumble layer, then spoon strawberries on top. Add the mousse again, then crumbles then strawberries and you’re done! Place your sweet little mousses in the fridge for at least 4 hours so they set nicely. This no-bake lemon cheesecake mousse will become your favorite summer picnic treat! You’ll require a food processor, large mixing bowl and electric mixer for this recipe. 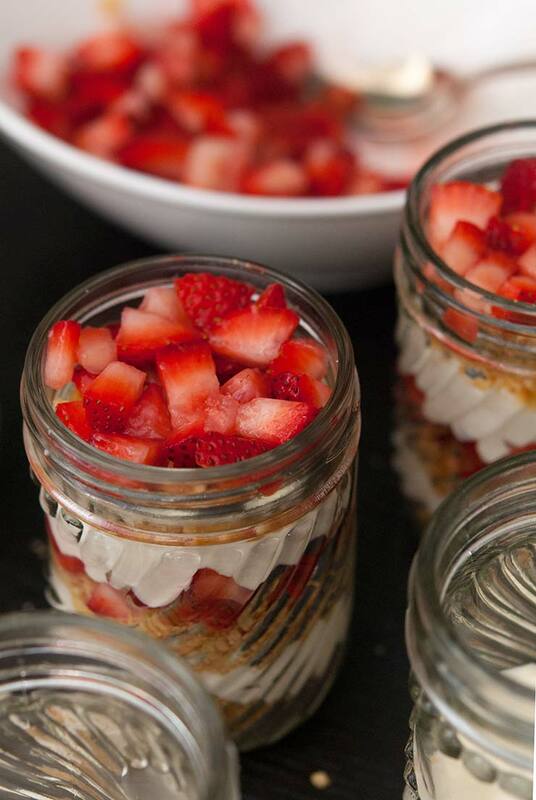 Chop strawberries into tiny pieces. Grind Nilla Wafers in a food processor, or put them in a bag and smash them with a spoon until they’re finely crumbled. Melt 4 tablespoons of butter and mix into crumbles throughly. Whip the heavy whipping cream until fully whipped in a blender. Pour into a large mixing bowl, then mix in cream cheese – preferably already whipped, but if you don’t have it, it’s fine. It’ll just take little more effort to mix. Spoon about 2-3 tsp. of the crumbles into your jars or cups – enough to make your first layer, and gently pat down. Fill a pastry bag (or just spoon) your mouse on top of the first crumble layer. Add another crumble layer, then spoon strawberries on top. Add the mousse again, then crumbles then strawberries and you’re done! Place your sweet little mousses in the fridge for at least 4 hours so they set nicely. Pack into a lovely picnic basket, and go to a summer movie screening in the park!